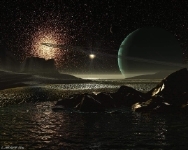 This is a research project suitable for undergraduate Astronomy and Physics students. It was put together by Dr Helmut Jerjen from the Research School of Astronomy and Astrophysics at the Australian National University. Please send me an e-mail if you are planning to do this project. I would be delighted to hear more about your own results. Enjoy and have fun! 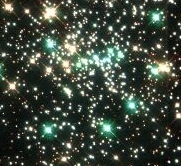 BLUE STRAGGLER STARS are unusually hot and bright stars found in the cores of ancient star clusters known as globulars. Globular clusters are located in galactic halos, of which the Milky Way may have from 180 to 200, or more. Most are located at least several thousand light-years away from the sun, and most are around 12 billion years old or more. The Milky Way's largest and brightest globular is Omega Centauri (NGC 5139), which contains about 10 million stars totalling about five million Solar masses spread over some 150 light-years. BACKGROUND (from wikipedia): Blue straggler stars are stars in open or globular clusters that are hotter and bluer than other cluster stars having the same luminosity. Thus, they are separate from other stars on the cluster's Hertzsprung-Russell diagram. 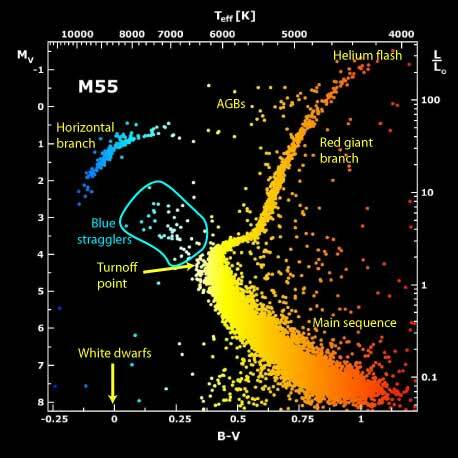 Blue straggler stars appear to violate standard theories of stellar evolution, in which all stars born at the same time should lie on a clearly defined curve in the Hertzsprung-Russell diagram, with their positions on that curve determined solely by their initial mass. Since blue stragglers often lie well off this curve, they may undergo abnormal stellar evolution. The cause of this is not yet clearly known, but the leading hypothesis is that they are current or former binary stars that are in the process of merging or have already done so. The merger of two stars would create a single star with larger mass, making it hotter and more luminous than stars of a similar age. If this theory is correct, then blue stragglers would no longer cause a problem for stellar evolution theory; the resulting star would have more hydrogen in its core making it behave like a much younger star. There is evidence in favor of this view, notably that blue straggler stars appear to be much more common in dense regions of clusters, especially in the cores of globular clusters. Since there are more stars per unit volume, collisions and close-encounters are far more likely in clusters than among field stars. One way to test this hypothesis is to study the pulsations of variable blue straggler stars. Blue stragglers rapidly rotate at a rate of 75 times that of the Sun's rotation. They appear to be two to three times the mass of the other cluster stars present. The most recent research reveals that near-by stars to blue stragglers have significantly less carbon and oxygen than their neighbors. This suggested that one star becomes hotter and bluer by pulling material from an orbiting star. The star thatÕs had material stolen from it has deep regions exposed that show areas where the starÕs original carbon had fused into heavier elements. Your student colleagues from the Monash University monitored under various atmospheric conditions the blue straggler star NJL220 in the globular cluster Omega Centauri (17,000 Lj away) using the 74-inch telescope at Mt Stromlo in 2002. The data is available here. They ask you to establish a light curve and other physical parameters of that star to improve the results that have been published 23 years ago and 19 years ago (Da Costa & Norris, 1986, IAU symposium 126, p. 681-682). Browse through the 40 CCD fits images they observed for you, using ds9 and identify the faint blue stragger star. It is at (x,y)=(273,494) on the CCD. Load 4 files into ds9 and blink between the images to see a possible light variation relative to the other stars in the neigbourhood. What else do you notice that might me important for the data analysis? Using the IRAF command "hselect" you can get the exact observing time (MJD-OBS keyword in the image header). Record the accurate date/time(in seconds) for each image. Use the IRAF command imexam and the "a-key" to measure the instrumental magnitude of the Blue Stragger (mag_bs) on each CCD frame. Important: because you are working in a crowded field, you need to set the radius of the aperture for the photometry in a way that you can avoid measuring fluxes from neighbouring stars. Does it matter if you only measure a fraction of the light from the BSS to avoid neighbouring stars? Explain your answer. Once you decided on a suitable aperture radius, go and edit the "rimexam" parameter file by writing in IRAF "epar rimexam" -> change parameters if necessary -> quit with ":q". Something does not look right and you have an idea what the problem could be. As the CCD images were obtained under all sorts of atmospheric conditions not all the data is photometric. Some of the measured fluxes must have been affected by cirrus and clouds. You can solve this problem by comparing the derived magnitudes from the NJL220 with that of another star in the same field. Choose a second (bright) star in the field that is NOT variable (e.g. at x=206, y=618). The instrumental magnitude from that star, mag_cs, shall serve in the following as zero point for the differential photometry. Go back and record the magnitude of the control star employing the same photometric aperture as before and compute the instrumental magnitudes in all 40 frames. Plot m_bs-m_cs as a function of Julian date. How does the light curve of the BSS look now when compared with the control star. Estimate the duration of the pulsation cycle and the average brightness. In the meantime, your colleague at the 2.3m ANU telescope at Siding Sping photometrically calibrated the first CCD image (ccd0247.fits). She informed you that the star at the postion x=207, y=618 has a B-band magnitude of 14.58 mag . Use this information to calibrate the time series of the BSS. Discuss your results within the context of other people's findings about NJL220 reported in publications, e.g. Da Costa & Norris (1986) or search ADS. What are effects not taken into account in our experiment (2nd and 3rd order effects) and how could the experiment be improved? What about Galactic extinction? Data credit: Monash students of the year 2002 obainted the CCD images at the 74-inch telescope at Mt Stromlo.